Do you want to help your kids fall asleep at night with calming bedtime stories and meditations? 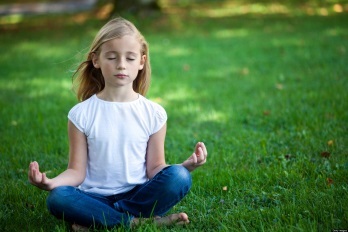 Would you like your children to learn meditation? Michael Phelps’ Olympic swimming success came not just from his incredible athletic abilities but also from a coach who taught Phelps as a child to calm his mind through relaxation and meditation. If you are looking to teach children and teens of all ages how to meditate and be more mindful, have them practice mindfulness as soon as they wake up. It helps set the tone for their nervous system for the rest of the day. For example, have them pay more attention as they’re brushing their teeth or eating breakfast. Focus on the sights, sounds, smells and feelings. If you walk with them to school have them notice how their feet feel on the pavement, the sounds around them, the colors and so on. You don’t have to sit for a long period of time to get any benefit. If you sit noticing your breath for even 5 minutes this will give your body, mind and emotions the opportunity to come back into balance with each other. Children are wonderful to work with because they are so in the moment and their imaginations wonderfully active. It is actually easy to teach them to relax, de-stress and connect to their own inner source of calm. Start by just having them simply notice their breath, how their chest rises and falls with each breath and if they are younger, getting them to notice their tummy and have them blow it up like a balloon. You can join in this with them and it will be a bonding experience for both of you. There is no end to children’s creative imaginations. Children’s stories and meditation MP3's that are designed to teach children good values, confidence and self- esteem while listening can also lull your little ones off into a peaceful sleep.